SoftDigi Easy GIF is a $20.95 suite of tools for creating and editing animated GIFs. The program doesn’t require any artistic or design ability. Open an existing animation and you can resize it, remove frames, change colors, set transparency and more, all in a few clicks. A comprehensive editor allows drawing lines and shapes, adding text, spraying or filling areas with color, applying special effects, and more. These tools have far more power than you might expect. "Line" isn’t just "click > drag > release > line appears": there are line, polyline and pencil tools, with control over thickness, line and brush styles, line and fill colors, transparency, optional arrowheads, a shadow effect and more. It’s a similar story with the Text tool. As well as the usual horizontal captions, you’re able to display text in a circle, arc, angled or vertically, with rotated characters, in a custom size and color, with your preferred transparency and shadow settings. We should probably mention that these are vector objects, too, making them very easy to revisit and edit later. Whatever you’re doing may be previewed at any time, either internally or in a browser. An excellent "Save As" dialog gives control over the number of colors and dithering method, as well as various optimization tricks (crop transparent areas, merge identical frames, rework color maps). This could be a handy way to optimize existing animated GIFs, even if you’re not editing them. There are options to export your animation as SWF, AVI, or individual or selected frames. SoftDigi Easy GIF also provides a capable wizard for creating animated banners. You’re able to set a banner size, define a background picture, set colors, enter up to 5 text messages, and animate each one with your choice of more than 100 effects. The program also has a separate module for creating animated GIFs from videos. At least, that’s the theory: not only did this not work in our tests, it locked the program up entirely. It’s not the biggest of deals because there’s capable freeware to do this already, but if Video > GIF is an important feature for you, be sure to test it carefully. SoftDigi Easy GIF has some issues, and its interface isn’t always easy or intuitive to use. The main editor and sheer depth of functionality won us over, though, and if you need an industrial-strength GIF builder then it’s worth a look. 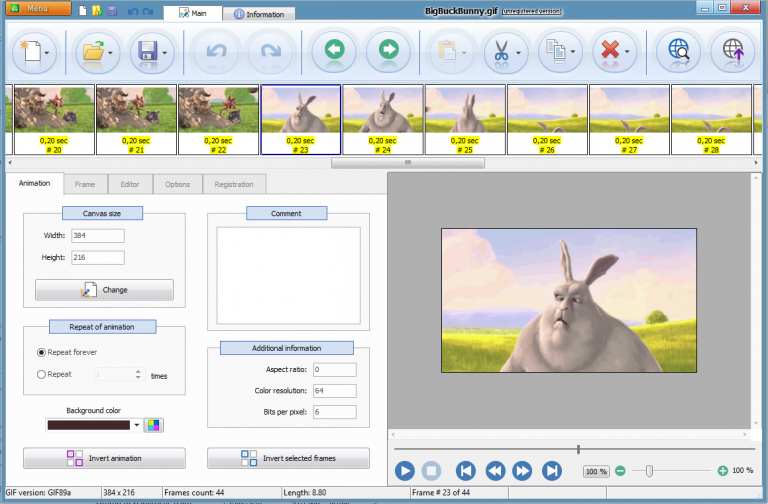 SoftDigi Easy GIF ($20.95) is available in a 14-day trial build for Windows Vista and later.